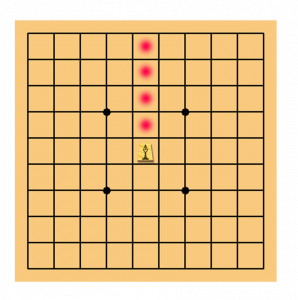 Each turn a player can move one of his pieces on the board. But pieces have limited movements. Let’s see what moves are possible. King – the most important piece. Taking a king finishes the game. 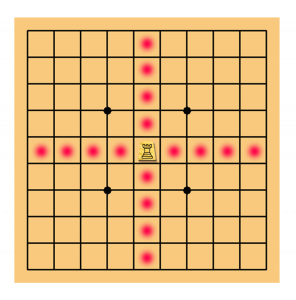 The king can move to a chosen adjacent square. Each player has 1 king. Rook – the strongest piece. The rook can move horizontally or vertically onto a chosen square, but it cannot jump over other pieces. Each player has 1 rook. Bishop – usually as strong as the rook. 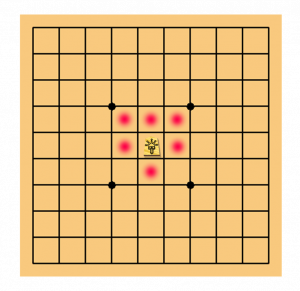 The bishop can move diagonally onto a chosen square, but it cannot jump over other pieces. Each player has 1 bishop. Gold General – king’s helper. 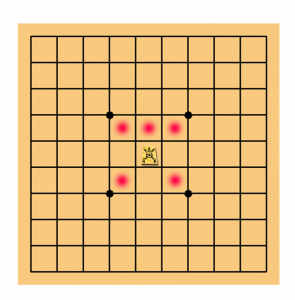 The gold can move similarly to the king, but excluding the back diagonal squares. Each player has 2 gold generals. Silver General – good attacker. The silver can move similarly to the king, but excluding the side and back squares. Each player has 2 silver generals. 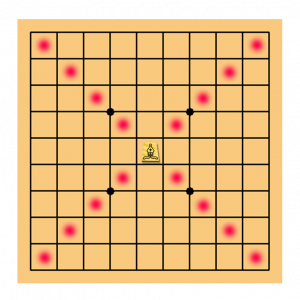 Knight – it can jump through the board quickly. The knight moves in a weird way: count two steps forward, then choose the left or right square. Only the knight can jump over other pieces. It cannot retreat. Each player has 2 knights. Lance – far-reach piece. The lance moves only forward by a chosen number of squares. It cannot jump over the pieces and cannot retreat. Each player has 2 lances. 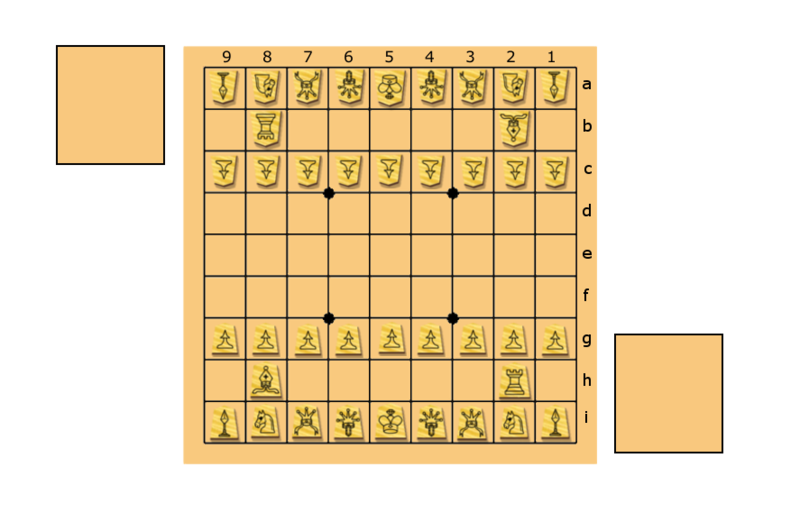 Pawn – the smallest piece but the biggest in number. The pawn can move only one square forward. It cannot retreat. Each player has 9 pawns. This is the initial position for the whole board. You do not need to remember it for now. Now that you know your team, let’s see what it can do.